What's Your Prescription For Change? The leaves are changing colors, the temperatures around the country are dropping and change is in the air. Soon we will be marching to the polls or if you live in Oregon, marching first to the kitchen table to fill out your ballot and then to your mailbox. One of the most important issues in this election is healthcare. Healthcare providers including nurses, are all too aware that our system is broken and they are speaking out in record numbers with their own suggestions for improvement. 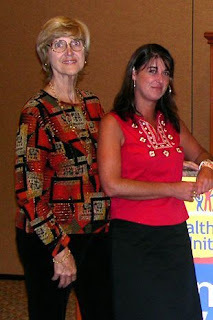 Take a look at Healthcare United's website and read selections from the 4,000 "Prescriptions for Change" that were sent in from supporters and then delivered to Congressman John Dingell (D-MI), Chair of the Committee on Energy and Commerce, at the Democratic National Committee Convention last month in Denver. You will note a familiar theme and one that the presidential candidates are including in their platforms-PREVENTION. The National Nursing Network Organization was also encouraged to see the Office of the National Nurse Initiative mentioned as a solution. Democracy requires the participation of all Americans who are 18 and older. This means voting, but you must be registered to do this. So, if you have changed your name, moved, or are in the least bit confused whether you actually completed a voter registration form, Healthcare United has made this easy. You don't even need a 42 cent stamp and there is a link to double check whether you actually are registered to vote in the state that you live in. Visit http://healthcareunited.org/action/register/ today and make sure you are able to vote in what is shaping up to be one of the most important elections in our lifetime. 1110 Longworth House Office Bld. The Michigan Nurses Association (MNA), Michigan nurses’ voice for over 100 years, is the largest nurses union in the state of Michigan. The MNA promotes the economic and general welfare of nurses in the workplace, fosters high standards of nursing practice and lobbies the legislative and regulatory agencies on health care issues affecting nurses and recipients of nursing services. Honoring our mission, it is with great pleasure that I announce our full support of the initiative to establish an Office of the National Nurse. We believe, as we know you do, that it is necessary for nurses to provide quality, safe, and compassionate care to all Americans and this must include prevention. The designation of National Nurse will provide the authority, impetus, and public recognition needed for the nationwide focus on prevention. Further, we recognize the potential of having a National Nurse who could meet with health care leaders to highlight health disparities and bring forward new ideas to solve these inequities in all communities. nurses do and for your advocacy in improving the public's health. We look forward to reintroduction of legislation that will create the Office of the National Nurse. Please know you may call upon us for assistance when this happens. 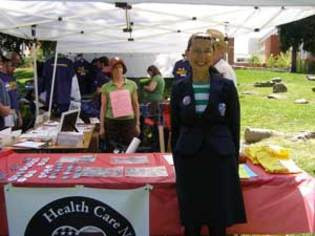 Thank you to Healthcare United, especially Michael Dolan and Mara Kieval, for inviting NNNO President Teri Mills to participate in a rally held at Sunken Gardens Park during the DNC Democratic Convention in Denver. Mills was able to share the Office of the National Nurse with six members of the press as well as several dozen rally participants. All expressed enthusiastic support for the idea to take the existing position of the Chief Nurse Officer of the USPHS and elevate it to full time status within the Office of the Surgeon General. Rally participants agreed with asking Congress to officially legislate the CNO of the USPHS to become the National Nurse for prevention. Many commented they wished this idea had been initiated years ago, claiming it would likely improve the public's health and be a huge morale boost for the nursing profession. The National Nursing Network Organization is a non-partisan 501 C4 corporation. Just like similar campaigns and initiatives seeking prevention, endorsements have been provided by partisan organizations. Support is welcome from ALL individuals and organizations who value prevention. Thank you Dr. Debra Toney, President of the National Black Nurses Association and Millicent Gorham, Executive Director for welcoming our Board back to speak at the 36th Annual Institute and Conference in Las Vegas. The theme of this year's event was The Prevention and Management of Chronic Disease. Eighteen other countries are doing better at reducing preventable deaths than the United States. The United States spends $1.3 trillion on managing the impact of the 7 most common chronic diseases and if we continue with the current efforts there will be a 42% increase in cases of these same diseases. How many more trillions of dollars are we willing to spend to maintain the status quo? Our session, “Promoting Prevention Through Nurse-Led Initiatives” introduced attendees to the Office of the National Nurse initiative. Based on their ubiquitous presence in all communities and the high degree of trust bestowed on them, nurses can play a major role in prevention, thus reducing both morbidity and costs related to chronic disease. By designating the Chief Nurse Officer of the USPHS to officially become the country's National Nurse, Congress will providing n impetus for promoting the Medical Reserve Corps, through which volunteer nurses and other health workers could replicate and expand existing health promotion programs that have proven to be successful. 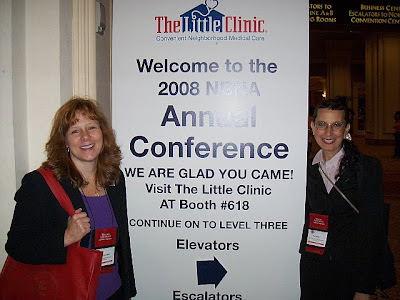 We were pleased to see the number of nurses who came to this presentation. There were twice as many attendees as last year. Interest for the Office of the National Nurse initiative was also high among NBNA members who sought us out in between sessions. Those we spoke with agreed the Office of the National Nurse initiative would be valuable in moving the nursing profession and improving the health of our nation. 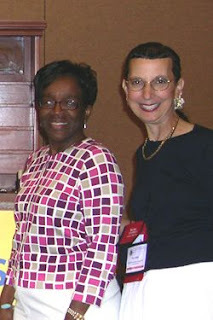 One of the highlights of the NBNA Conference is the banquet held to recognize and the NBNA Nurses of the Year. 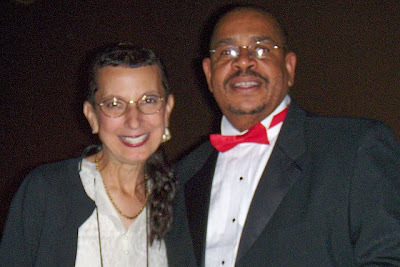 We were honored to sit with the Nurse of the Year for Community Service, David E. Simmons, Jr., RN, MSN, CNN, Clinical Director of the Nephrology Outpatient Department and Instructor at the University of Virginia's School of Nursing. This award is given "to recognize outstanding and exemplary community service. The NNNO Board of Directors congratulates Mr. Simmons on this achievement and thanks him for his service of improving the lives of others. A new survey recently released further demonstrates the need to provide the Hispanic community with effective health promotion interventions. Funded by the Pew Hispanic Center and the Robert Wood Johnson Foundation, the report, Hispanics and Health Care in the United States: Access, Information and Knowledge, published on August 13, 2008 (By: Livingston G, Minushkin S, Cohn D, Pew Hispanic Center and Robert Wood Johnson Foundation) examines the results of a telephone survey of 4,013 Hispanic adults. The survey was designed to explore how the diverse characteristics of the Latino population affect their health care needs, their sources of health care information, and their knowledge about chronic disease. More than one-fourth of Hispanic adults in the United States lack a usual health care provider, and a similar proportion say they obtained no health care information from medical professionals in the past year. At the same time, the report finds that more than eight in ten receive health information from alternative sources, such as television and radio, rather than medical professionals. Recognizing the vast growth and the increasing diversity of the Hispanic population in the United States, RWJF and the Pew Hispanic Center designed this survey to provide up-to-date, accurate information on Hispanics and health care to help address improvements in public health interventions and medical care to reduce disparities. The National Nursing Network Organization sees this report as additional support for having Hispanic nurses, guided by the Office of the National Nurse, become involved in health promotion activities in Latino communities. Bi-lingual, bi-cultural nurses could be major players and key to successful National Nurse activity at the local level. Their active involvement in Medical Reserve Corp units would be especially valuable in disaster response situations. Efforts to reduce health disparities could focus on reducing obesity and diabetes. In collaboration with local public health leaders and key community stakeholders, Latino nurses could advocate for increased community facilities for physical activity, as well as promote healthier nutritional practices in schools and workplaces. Creating an Office of the National Nurse for prevention is the initial step in the plan to engage nurses, especially those from communities with higher health disparities, in local prevention efforts. The many nursing organizations that now support this initiative, would welcome the addition of the Latino Nurses organizations and feel their efforts could make a significant difference for Latino communities throughout America. We encourage you to contact organizations you belong to and encourage them to revisit this important issue, review the updated information and decide to join the growing list of endorsements. Health care is very important. These figures are good to see, but sad to see as well. I'm very interested in hearing what some of the political candidates have to say regarding this issue. Your thoughts? However, in the meantime, take a look at this! Talk show host, Cristina Saralegui has paired up with AARP to to help spread the word about their great benefits! Definitley check out AARP for yourself or for a relative or client.